Yesterday on Monday 15th September we saw the sights of Burberry, Tom Ford, GILES and many others as Fashion Week draws to a close today. Here is a selection of styles and designers who made a good impression in my eyes. I feel everyone has high expectations for Burberry, mainly because it's such a well- known brand amongst fashionistas. 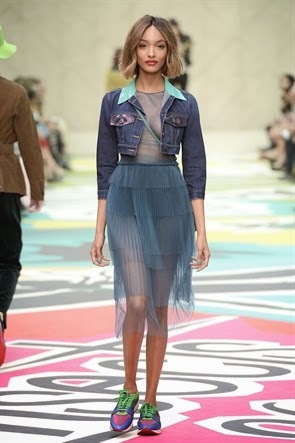 Burberry showcased many different textures from fur lined denim jackets to ruffled skirts. Also I loved how they brought the leisure to the outfits, i.e, the trainers, which is becoming a common style as Topshop showed the 'sporty' look also. Christopher Kane used mainly dark tones in his collection like dark purples, blacks and grey, which for a Spring/ Summer preview is slightly different from the typical bright colours. However I loved his pieces, the purple dress below is unique with the spider like pattern across. 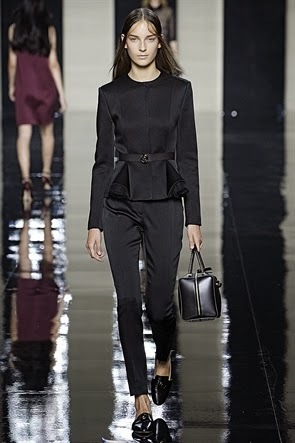 I also loved the third outfit with the peplum style black top paired with matching silk bottoms. However the detail in the second dress was 'WOW'. It was classy but spontaneous a real win-win for the daring kind. GILES style was very mature with a hint of fun loving. A mixture of bright and dark colours really compliment the collection. 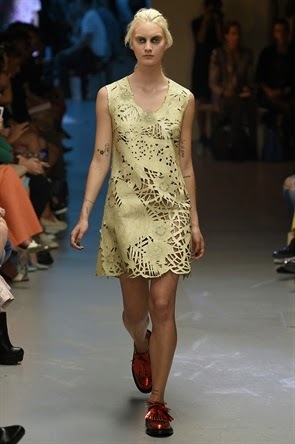 I love the dress below, the shiny sliver detailing looks classy with an edge alongside the yellow dress also below, I love the spiderweb cut out designer and the pale yellow creates a typical spring vibe. I LOVE Huishan's collection! It's probably my favorite collection alongside Julian Macdonald's! All her pieces are cute and stylish with different textures. Furry clutches, sequined tops and t-bone shoes, defiantly make the looks! I adore the top below with a cute button up shirt, embroider with flowers and silk detailing!! I love the way you covered all days at LFW!! Good job! !